63750 - Moroso Electric Water Pump Drive Kit is rated 4.7 out of 5 by 3. Rated 5 out of 5 by Wedgehog from This was an easy installation read directions figure out which side of motor and install !!! Going on my Stocker!! Rated 5 out of 5 by COPPERHEAD from VERY COMPACT IT IS WORKING GREAT. MY OLD ONE WAS TEN YEARS OLD. Can this electric pump work off 16v and what's the flow rate? THis pump is designed to be run using 12 volts, the flow rate will be determined by the water pump being used. This will run at approximately 2600rpm. Will this water pump fit AMC 390? 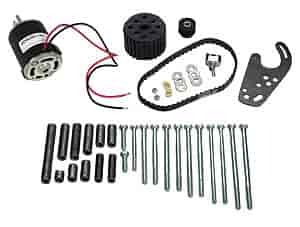 This is a universal kit and can be used on AMC motors.